The Australian Government released a long-debated bill that totally changes the rules on the marketing for cigarettes. If this project will enter into force, Australia will become the country with the toughest anti-tobacco rules. Project forbids companies to sell cigarettes in packets used so far, with brand logos and various colors. Various brand names will be engraved in small letters and uniforms on the package and all packages would have the same design and same color, probably olive green, tinged considered as “abhorrent to consumers”. Australian Health Minister Nicola Roxon said that cigarette packs must send only messages related to disease and death. On the other hand, it is expected that larger producers to sue the government for violations of laws relating to trademarks. “What company would stand idly by when the brands that are worth billions are simply prohibited the market?” said a representative of Brittish American Tobacco. The same representative said he was convinced that no beer companies or networks of fast food will not remain indifferent. The Australian Government believes that the measure will reduce the attraction that cigarettes exerted especially on youth. Australian cigarette market generated total revenues of 8.3 billion Australian dollars in 2008, an increase of 2.9% from 2004 to 2008. Diseases in close connection with smoking kills 15,000 Australians each year, smoking was identified by authorities as the most common cause of disease and mortality among those located but can be prevented. 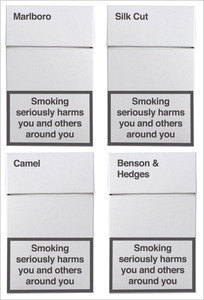 Studies have shown that the logos and package design will reduce the effectiveness of the messages that warn of the dangers they posed to smokers. Australian Government precautions taken so far have made ? ?the number of smokers, which reached 30.5% of the total population over 14 years in 1988 to decline in 2007 to 16.6%. It is intended that by 2018, only 10% of the population to be a smoker.